Imagine having a fun and exciting job traveling to exotic destinations such as the Caribbean, Hawaii, Alaska, Mexico, the Bahamas, Europe, the Mediterranean, or Tahiti. Cruise ship jobs offer free travel (including airfare to the ship), free room and board, plus starting salaries averaging $1,500 – $2,500 per month. You can even have members of your family travel with you at a reduced rate after you've worked on the cruise ship for a while. Accommodations are comfortable, and when you become an officer or manager you will have your own cabin on a higher deck, with a porthole or window. But of course you won't be spending much time in your cabin! How you spend your off-duty time is up to you. Imagine being able to enjoy hiking around ancient monuments in Rome, eating at a French café in Martinique, walking along a glacier in Alaska, or sunbathing on a sandy beach. With all the exciting things to do on a cruise, it's not surprising that the Cruise Lines International Association found more than 44 million Americans have expressed interest in cruising. What this means for you is that many cruise ship jobs are available. As long as you have the desire, you can become a cruise ship worker and get a job on a cruise ship. For nearly all entry-level positions, no prior cruise ship experience is necessary. If a cruise ship job sounds like the career of your dreams, the FabJob Guide to Become a Cruise Ship Worker is for you! In this e-book you will discover how you can get started and succeed in this exciting career. Author Julie S. Botteri is a Master Cruise Counselor. Her cruise experience includes managing the water sports and scuba programs for cruise lines including Renaissance Cruises luxury yachts and Princess Cruises. In this guide she shares with you her own experiences as well as insider tips and expert advice from other cruise industry insiders. To ensure you are considered for a job you want, you'll need to know what positions are available on a cruise ship. This is important because different positions have different requirements and different people to apply to. “Every ship has a cruise staff, loaded with talented, high-energy individuals essential to the guests' entertainment and participation in cruise activities. Your day may include lip sync contests, sock hops, pool Olympics, limbo and dance contests. This part of the guide focuses on cruise lines that offer the best job opportunities for U.S. and Canadian citizens. You will discover the cruise lines that will pay you the most, and those which have the greatest number of entry level positions. You can have all this and more for an incredible special price. People pay hundreds of dollars for cruise ship training courses. 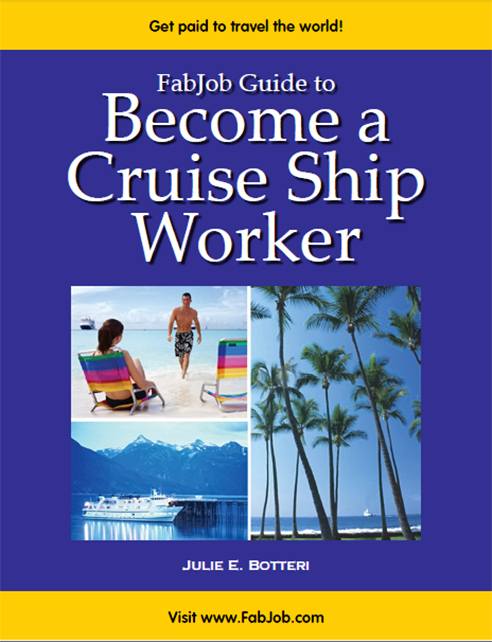 The FabJob Guide to Become a Cruise Ship Worker contains some of the best career advice you could get from other sources, and more. The information in this guide can save you many hours of research, help you avoid some costly mistakes, and give you information you need to start getting paid to travel the world as a cruise ship worker. You can earn back more than the price of the guide your first day on the job. If you believe you deserve to have the career of your dreams, this guide is for you. It gives you everything you need to know to get a job on a cruise ship. This guide was recommended in Porthole Cruise Magazine.